At the same time the James Beard Foundation announced the first annual Blended Burger Project™ Campus Edition, they concluded the third annual Blended Burger Project™ with a bang! 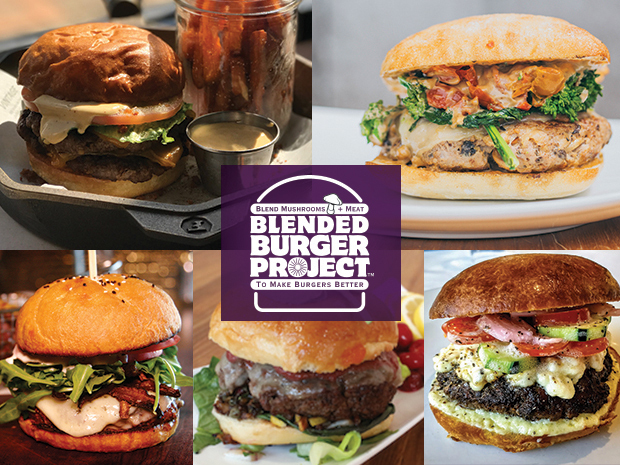 The Blended Burger Project™ contest concluded with 414 restaurants* in 45 states participating, and more than 400,000 consumer votes. Over the last nine weeks, the competition created a buzz on social media with more than 4,700 unique posts on Instagram and Twitter using the #BlendedBurgerProject hashtag. “The Blended Burger Project™ is a phenomenal opportunity for chefs to make their dishes more plant forward and for patrons to discover how their favorite foods can be made healthier and more sustainable, simply by substituting 25-50% of the burger’s protein with mushrooms. Chains, diners, white tablecloth bistros, upscale eateries in the heart of cities, the suburbs and small towns developed thoughtful and creative blended burgers. We congratulate and appreciate all those who took part,” said Kristopher Moon, vice president, James Beard Foundation. This is just in time for the James Beard Foundation’s introduction of a special Blended Burger Project™, exclusively for colleges and universities, starting Labor Day through Dec. 15. The James Beard Foundation is asking campuses to submit their blended burger, using at least 25% mushrooms blended with a protein of their choosing, to the official contest website and merchandise it to their students. For the first time ever, the six winning colleges or universities will send a chef to cook at the historic James Beard House in NYC in front of national media and food influencers. Bareburger, New York City – The Porchetta Burger is a 50/50 mushroom and wild boar blend, topped with a black-garlic aioli, broccoli rabe, oven-roasted tomatoes, aged provolone cheese on a ciabatta bun. The Bistro at Topsail, Surf City, N.C. – The Goomba Burger, local grass-fed Mills Family Farm beef blended with confit oyster and portobella mushrooms, topped with havarti, shiitake "bacon," lemongrass aioli, heirloom tomato, baby arugula on a house-baked bun. Cedar’s Cafe, Melbourne, Fla. – Brevard’s Taste of Summer Burger is a blend of mushrooms and lamb on an apricot and liquid-smoke-glazed bun, sour cherry mustard, basil, brie cheese and an herb lemon caper walnut relish. Houston Yacht Club, La Porte, Texas – The Greeklish Burger consists of a beef chuck, cremini mushroom and caper patty on a brioche bun and basil aioli with feta melted over the patty, topped with a mini Greek salad and paprika oil. VINTAGE Kitchen, Norfolk, Va. – The Backyard Burger, grass-fed beef blended with confit oyster mushrooms, aged double cheddar and cracklin', charred ramp mayo, bacon rust, cab franc molasses, crispy hayman potato straws, coffee salt, demi-pain perdu and brown butter mornay, cooked in a cast-iron skillet. Are you a college or university? Click here to register for the James Beard Foundation’s Blended Burger Project™ Campus Edition, sponsored by FoodService Director.